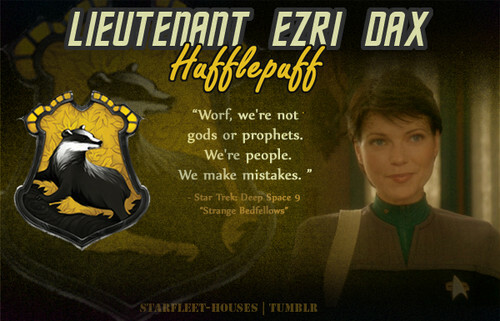 Ezri Dax - Hufflepuff. While timid and zaidi than a little jumpy, Ezri is a people person. She connects with people easily as a counselor should, and strives to make others feel better. Wallpaper and background images in the nyota Trek: Deep Space Nine club tagged: deep space nine star trek ds9 ezri dax ezri nicole de boer trek meets hogwarts hufflepuff trill.